I find sublime beauty in natural forms and patterns. With my work, I try to capture the dichotomy of texture and color inherent in nature. 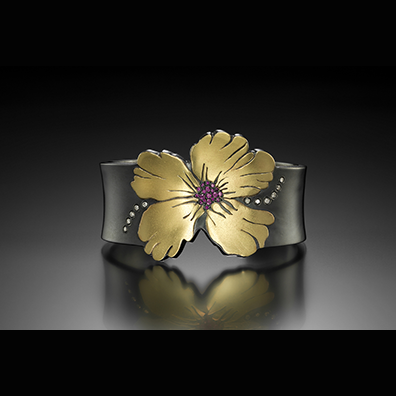 I use high karat gold, palladium and oxidized silver in most of my work. I use diamonds and colored stones in my pieces, but use them to produce a dusting effect as opposed to being the focus. My pieces can start with a casting and have many fabrication steps thereafter, or can be completely fabricated from sheet. I utilize abrasive finishes, embossing and patinas to achieve color and texture.